This entry was posted in Amouage, Fragrances, Orientals, Oud Fragrances, Perfume Review and tagged Amouage, Amouage Attar, Amouage Sandal attar, Amouage sandalwood, perfume review, Sandal attar by Kafkaesque. Bookmark the permalink. I adore Sandalwood too and usually get my fix via actual attars, Mitti and Champa being strong favorites (lovely ones from Floracopeia!). I’m not crazy about the sour aspects however so thhis wouldn’t be a good fit for me either. Sandalwood is now being grown in Hawaii,which might create a nicer oil, here’s hoping! I’ve never tried any of his stuff, but some of it sounds really lovely. I’m as certain as you are that it is not Mysore, and this way of listing the oil as ” (India) ” is good old marketing. That price is the norm for Australian sandalwood, but I think it’s worth me giving him a call and finding out his thoughts as to how this one compares. Rose-tinted glasses firmly in place for 2014! I also just looked at profumo.it and they do list Mysore sandalwood with an amusing caveat if you’d like a chuckle. The timing is lovely …. I am interested to note the indications for sandalwood in depression, aggression, frenzy, and lack of appetite. I just wish I could catch lack of appetite for a while, and I wouldn’t go looking for a cure for it in the near future. I’m so happy the first review of 2014 is for Sandal. As you know, I have been really eager to hear your thoughts on this one since I am no expert on sandalwood and I don’t think I have ever smelled real Mysore. All I know is that I absolutely love the creamy milkiness of this attar after you get past the green opening. While I agree, it is probably not Mysore, it smells infinitely better to my nose than most of the synthetic sandalwood you get in commercial scents these days and that is why I enjoy it so much. As you say, it is a single note attar so there is not a lot of nuance to it but, despite that enjoy wearing it both alone and along with other scents to help enhance the sandalwood note. And thanks for the comparison to the new Australian grown Indian Sandalwood. It would be interesting to know if this is from the same stock. FYI, the 12 ml bottle of Sandal is 380 dirhams or about $105.00 here in Dubai (not bad for an Amouage attar). The downside is that it is rarely in stock even at the factory in Oman. I waited about 3 months to get my last bottles and while I haven’t checked with the boutique in a while, I wouldn’t be surprised if it is out of stock again. But, if people are interested (in a sample or full bottle) you can check out the document on Facebook Fragrance Friends about all of the Attars. I am happy to put people on the list and see if we can get more (I am hoarding my precious 12 ml 🙂 ). I hope more people who bought samples from me will chime in with their thoughts here, I am really curious how people like this one. Oh, and for people who want an attar with more than just the sandalwood note, I recommend trying Shams Al Doha which has many more notes (Rose, Oudh, saffron…) but, seems to dry down to the same creamy sandalwood found here. It’s definitely not a synthetic version of sandalwood, that is for certain! The synthetic kind is so unbelievably generic and beige, with absolutely little of the creaminess this one shows. It’s simply amorphous woodiness. The Amouage Sandal, in contrast, has some character but the buttermilk aspect isn’t my personal favorite. The delicate floralacy which develops is very pretty, though. In that regard, the Amouage was much better than the Australian oil I tried which I really didn’t like very much at all. I greatly appreciated the chance to try it, Dubaiscents, so please accept my deepest thanks. And I hope anyone who wants to try ANY of the Amouage attars (and is on Facebook) will contact you. No-one can beat your local prices. $105 for the 12 ml bottle of Sandal? Fantastic!! It’s a shame it’s not frequently stocked, but you have so many other Amouage scents that I’m sure people will find more than a few to explore. Thank you for providing everyone with the opportunity, my dear. How I long for the opportunity to be a sandalwood snob. I’m not certain I have smelled the real Mysore, but I do have a bit of very old Indecence and old Panthere that have sandalwood in the drydown that is distinctively different from any other sandalwood base that I’ve smelled. Might there be some genuine Mysore in those? I remember very old vintage, original Panthere having Mysore sandalwood, but I’m afraid I can’t recall Indecence at all. Neela Vermeire’s Trayee has real Mysore sandalwood, and I know she spent a small fortune on it, especially as there is a lot of it in the fragrance. That’s part of why I love Trayee. I didn’t recognize it as Mysore, just unusually beautiful sandalwood. I got very excited when I saw the word Sandal in your title sentence. I am glad to hear that is not synthetic smelling and I am glad to hear that this has some of the creaminess that real sandalwood has. It is such a shame that we completely denuded the sandalwood forests in India in the ’60’s and ’70’s. 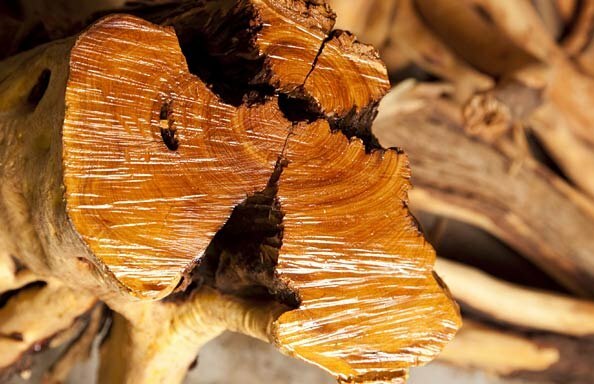 It take 80 years for the sandalwood tree to grow to maturity and years after that for harvesting. Perhaps in time, the trees grown in Australia will develop more heart and richness like old growth vineyards. We can only hope. I think the comparison to Old Growth vines, like Zins, is an excellent one. And you’re absolutely right about the number of years it takes for one of the trees to grow to full maturity. Anywhere from 40-80 years, but it takes just a few minutes to chop it down. I read somewhere that the Indian govt’s attempts to protect the trees from harvesting has just led to a black market where poachers cut them down even younger. 😦 Such a shame, because there really is nothing like that beautiful, aged, fiery red-gold smell of true Mysore sandalwood. I still have a good bit of sandalwood oil I bought in 1983 from the Karnataka State Government. It came in a tin bottle sealed with a cork and wax. I am sending you some!!!!!!! You are the soul of generosity, my dear Tora, but there is no way I’m accepting anything as rare or precious from you. I mean it! I’m touched beyond belief, but I can’t accept it, love. I send you a huge massive hug, though. And thank you. “You can find the smallest size (12 ml) starting at $250 or €168, which is better than Tribute’s opening price of $370.” Not giving it away, indeed! 😛 I need to try these Amouage attars. Maybe not this one specifically, but I just really don’t want to fall in love with that which I could never afford. Maybe I just need to blow some money on a split and try some. But what I really need to do is figure out which of the Amouage men’s line is my favorite. There was one that I positively adored and now I don’t know/remember which one it was. I loved Reflection and Lyric, but neither of them was it (though I wouldn’t mind a bottle of Reflection…). And I know you’ll think I’m mad for having worn it several times and never remembering which one, but the single-name convention has them all running together in my head. I *think* it might have been Interlude or Memoir. And what’s crazy is reading notes of either, I have no idea. I couldn’t describe it if I tried – it sent me into such a euphoric haze each time I dabbed it on. I remember it having a slightly medicinal quality to it. And I realize none of that has anything to do with Sandal Attar except I just wanted to say I’m sort of enamored with Amouage now. Glad I didn’t write them off earlier. The only one I’ve tried that I don’t really like is Gold. It’s okay, but not something I’d choose for myself. LOLOLOL, you can’t remember even after a few times? My dear, this is one of the reasons why I encouraged you to take notes and really focus when testing things. If it was very herbal at first but ended with a stunning, creamy, sandalwood heart, then maybe it was Interlude Man. If you have any more left of your sample, perhaps you can try it again? I know! I know! Lesson learned! The more I think, the more I think it was Interlude (unfortunately, I drained that sample quickly!). I may need to buy a sample just to verify. If it’s what I’m thinking, I have a feeling I’ll need a whole bottle. It’s usually easy for me to remember which is which, but I went through a period where I would just cycle through all the Amouage samples randomly, and given that plus the one-word naming convention, I just sort of lost track of it all! As part of the 60’s generation, I remember sandalwood everywhere and the luscious smell of it in the beads, incense, and even book marks. Little did I suspect it was a wasteful and ultimately destructive use of so precious a resource. Now I wear Neela Vermeire’s Mohur for my sandalwood fix. (I hope the extrait comes out soon!) I also like the sandalwood used in Chanel’s Bois des Iles, but not to wear, but on paper. So weird. 🙂 On paper Bois des Iles’ sandalwood lasts for days if not weeks and it is just superb – having a calming and revitalizing effect. 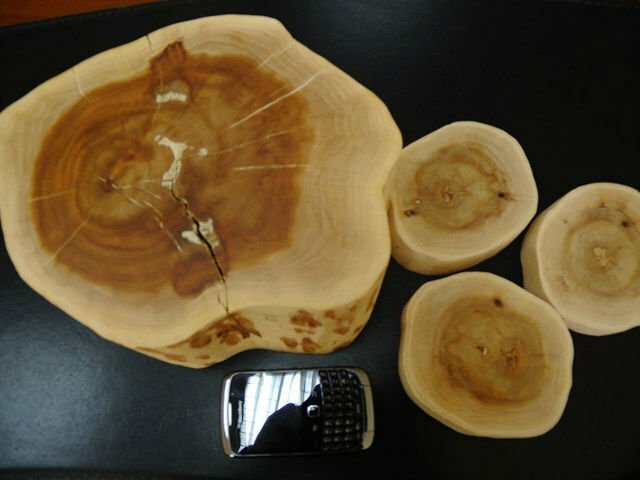 Australian sandalwood just doesn’t come close IMO to Mysore sandalwood. It’s not ‘awful’ it just doesn’t create as rich or evocative a fragrance experience. That said, neither of my Amouage attar experiences have been wonderful. Tribute was ‘totally tobacco’ and Homage was more ‘just jasmine’. Neither were unpleasant, just not what I was expecting from the hype for perfumes costing so much. I’m still so bummed about your Tribute experience, and really think that your sample was a bad batch. 😦 I know you got yours from a Basenotes split, but another blog reader had the same experience as you with a sample that he got from Luckyscent. Like you, his was all tobacco and ashtray notes. When he ordered from Surrender to Chance, however, he experienced something totally different, akin to what I got. If you ever order anything from StC, perhaps you can toss in a small vial of Tribute with your order, just to see if it is an issue of bottle, or if your skin really turns it all to ashtray and tobacco in all cases. Such a pity you had a wonky time of it. Even worse, such a shame that the fragrance is so damn inconsistent across the lines! As for Bois de Iles on paper, how interesting! Have you tried it on fabric, to see if the scent carries and stays even further? Like you, my dear Kafka, I am also a lover of sandalwood and along with saffron and a few others, is one of my favorite notes in perfumery. What you say here just clarified a point, or rather, a concern I have with other sandalwood varieties and perfumes: I dont feel the red, golden vibrancy of true sandalwood in most but the greenish, almost, sappy (maybe wet and grassy?) feeling I get with non-mysore sandalwoods. I like my sandalwood really really creamy. Any suggestions? I own and love Santal Majuscule and Santal Blush and till lesser degree Santal 33. I got also Cocoa Sandalwood but I just cannot like it. I dont really know why. The same goes with Lutens’ Santal Blanc and Santal de Mysore. I almost feel broken when I say this. ps: I got samples of Fille en Aiguilles and Fourreau Noir based on your predilection for both and I have to say I adore them–Though, the former gets a bit too soapy on me. I certainly blame my own skin for messing around with it. I need to test them a bit more to have a more mature opinion. right now, it feels just like wild love. Green, sappy, and even a little grassy….. *sigh* Yes, that seems to sum up a lot of the modern or Australian type at BEST. At worst, there is just an amorphous, beige woodiness that is vaguely creamy, but nothing like actual sandalwood. It’s pretty sad. The best modern sandalwood fragrances are from Neela Vermeire, but I wouldn’t describe most of them as “creamy.” Trayee is a stunning spice and incense fragrance with about 24 ingredients, from saffron to cardamon, jasmine and more, all centered on real, actual Mysore sandalwood. Her Mohur is a rose-violet-iris scent with sandalwood, Bombay Bling is a fruity floral with sandalwood, and the new Ashoka is a creamy fig and iris scent with some sandalwood too. I’m not crazy about the latter, though I think it’s beautifully done, but Ashoka is much, much loved. So, your best bet to experience real sandalwood would probably be to order samples of the Neela Vermeire line from Surrender to Chance or from her website (which is the better price per size). However, I don’t think any of those (with perhaps the exception of Ashoka) would translate as purely creamy sandalwood. They’re all far too complex for that. BTW, I’m SOOOOOOOOO glad you adore my Serge Lutens favorites! It’s a huge shame that Fille en Aiguille turns soapy on you, though. I don’t think I’ve heard that before. 😦 Hopefully, a few more tests and you’ll have a better sense of it. But I can’t wait to hear more about your experiences with Fourreau Noir, as I know you were iffy about the lavender issue just like I was. When you get the chance and have tested it more, write in that post/thread about what Fourreau Noir smells like on you. I’m dying to know. Happy New Year dear Kafka 😀 , may this 2014 be a great year for you and your loved ones, many blessings and perfumes to come. Regarding the perfume, this seems like a nice fragrance with good quality ingredients, but an absolutely horrible price tag almost 500 for just a small 30ml or even 168 for just 12ml, I would never buy this just because of the price. But I´m happy that you got at least a pleasant break from the horrible experience from the other synthetic perfumes you tried before this one. But back to this fragrance, it is an attar which is actually a super concentrated, distilled essence oil, not a regular perfume. So, you can’t compare its size to regular fragrances, and a few drops go a long way. 12 ml or 30 ml of an attar is really the equivalent of 10 times the amount of a spray perfume, and perhaps even more so for an eau de toilette. Happy you found a sandalwood attar, which I do not have to buy! And from Amouage, whew. Great analysis Kafka. I have avoided the Attars from this house but when I get to them, maybe 2014 I will start with your other suggestions. This Sandal does sound like the Santalum spicatum which is the native Australian sandalwood. The Mysore sandalwood issue is really about how old or even vintage the oil is. Like wine, but I have no idea what the cut off point is from amazing to ‘too old’. But I would like to know! Trayee is the one, a masterpiece which accompanies me everywhere. I would take a wild guess and think that Trayee went to Paris and back with you? Sandalwood Dreams to you Kafka. Let’s hope you find a sandalwood reality soon. But those memories of the glory days of Mysore sandalwood are great to have. You definitely must try Tribute, Jordan! Fingers crossed that you don’t get a wonky batch, because what I tested really was glorious. Amouage in Dubai Mall has 2 bottles. It can be ordered upon request by Amouage boutiques and takes any where from a couple weeks to a month. They normally do not carry this. I ordered a bottle and it arrived rather quickly. I believe less than 1 month. They have 2 other bottles that someone ordered and never collected.